The heart holds a special sparkler (yes, the firework...) that is only ignited when you've found the right one. That sparkler was set ablaze the very first time he laid eyes on her. She was right where she needed to be on that January evening at her daughters basketball game. That's where they had the chance to meet after she decided to stay after her daughter's game to watch a friend's son play — which just so happened to be his nephew. From that moment on, he knew she'd be his wife. She possesses effortless beauty, elegance, grace and kindness. "Her outer beauty doesn't even compare to how beautiful she is on the inside and her heart is unmatched." She was guarded due to past relationships, but he was everything she could ever wish for in a husband — and she knew it. He was honest, had an amazing relationship with his family and God, real, and effortlessly kind. Phone conversations turned into late-night phone conversations that turned into sleepless nights. With Valentine's Day approaching, he knew he wanted their first date to be special so he asked her to be his Valentine. "There was no way she could say no to my irresistible charm and bowlegged sway!" He was right. Although their first date was the best first date she'd ever been on, filled will laughter and a genuine good time — she was reluctant to go on another date because there was "no way this guy could be this perfect". She was wrong. Her friends knew he was the perfect match for her. They were embraced by each other's families and became intertwined almost immediately. It's easy when you're as genuine as these two are. In the southern charm of the Rucker John's restaurant at her family dinner — he seized the moment, sank to one knee and asked her to make him the happiest man alive and be his wife. She was stunned into a fit of blissful tears, then she cheerfully agreed. Surrounded by all of their loved ones, Anthony was ready to tell the whole world that there was only one girl he'd hold hands with, dance with, and share his heart with forever. Theresa Kimberly. Each time he crossed her mind that day, her eyes filled with tears of pure exhilaration. She was ready to spend the rest of her life as Mrs. Powell and walk side by side with her "prince charming" as God leads the way. Kim and Anthony, I am so honored to have had the tremendous amazing opportunity to photograph your wedding day. The day was so perfect, your families are amazing, and I'm so honored to call you my clients, my friends, and my family! I wish you a lifetime of memories, good times, good vibes, and huge smiles. And may your sparkler forever blaze bright! The day started in the beautifully lit salon of Matt Holder Hairdressing where all the ladies got ready for Kim's big day! Kim, that dress is stunning. Really! 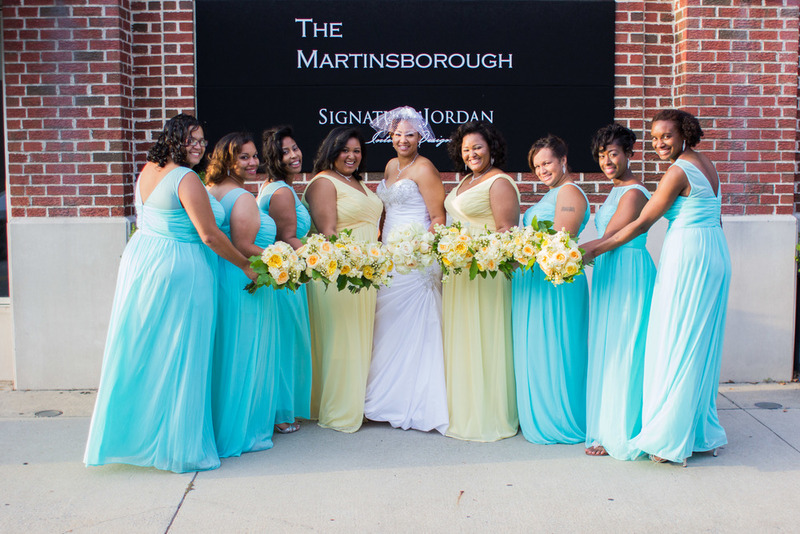 The Martinsborough here in Greenville was the perfect choice for venue for their day! This amazing wedding wouldn't be possible without the amazing creative team who brought this couple's vision to life!